On Sunday, March 4, 2012, a team from the Canadian Cooperative Wildlife Health Centre (CCWHC) Atlantic regional node investigated a mortality event of grey seals on Hay Island, off the east coast of Cape Breton Island, Nova Scotia. 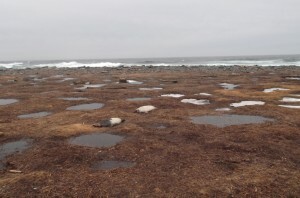 Anticipating a hunt of grey seals, members of Humane Society International had visited the island earlier and contacted Department of Fisheries and Oceans (DFO) officials because of what appeared to be an abnormally high number of dead seal pups on the island. The CCWHC diagnostic team and a DFO marine mammal scientist accessed the island by helicopter and performed post mortem examinations on 10 pups. All animals were still in very good body condition. The cause of death could not be determined by gross examination alone. The estimated total mortality based on a systematic count of the whole island was 400 pups. Approximately 3,000 pups are born on this island each year. Samples from these animals have been taken and are currently under investigation by CCWHC veterinary pathologists.